A study of the previous five referendum elections relating to European Union treaties (Amsterdam 1998, Nice 2001, Nice 2002, Lisbon 2008 and Lisbon 2009) reveals a remarkable constistency in terms of regional turnout and voting trends in these contests with certain constituencies tending to consistently rank amongst the highest or lowest in the state in terms of turnout levels and support levels for the Yes or No side in these contests. In particular the lowest turnout levels and highest support for the No side in these campaigns tends to be found in the Donegal constituencies, while the highest turnout levels and highest support for the Yes side in these campaigns tends to be associated with the Dun Laoghaire and Dublin South constituencies. Figure 1 shows the average turnout by constituency across the previous five European Union referendum votes. With general and local election contests, turnouts in rural constituencies tend to be signficantly higher than those in urban constituencies (although this gap has narrowed signficantly in recent contests). 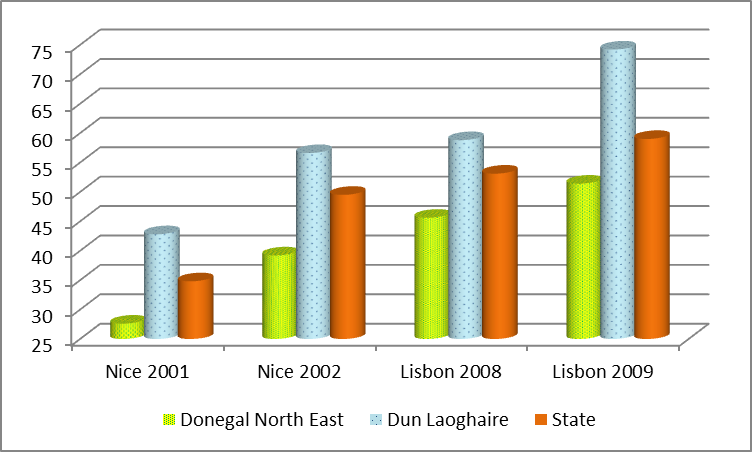 By contrast, the constituencies with the lowest turnout in European Union referendum votes tend to be mainly clustered in western and mainly rural parts of the state (although low turnouts are also associated with the more working class areas within cities) with the two Donegal constituencies consistently returning the lowest turnout levels in all these contests. The high turnout constituencies tend to be associated with the more urban and middle class parts of the states, with the highest average turnouts found in Dun Laoghaire, Dublin South and Dublin North Central constituencies; turnouts in the more middle class constituencies in Dublin have tended to be, on average, 6.5% higher than those in the more working class constituencies. On average, the European Union referendum turnouts have been higher in Dublin (average of 52.7%) than in the rest of Ireland (49.9%) and especially higher than in the Connacht-Ulster region (48.1%). 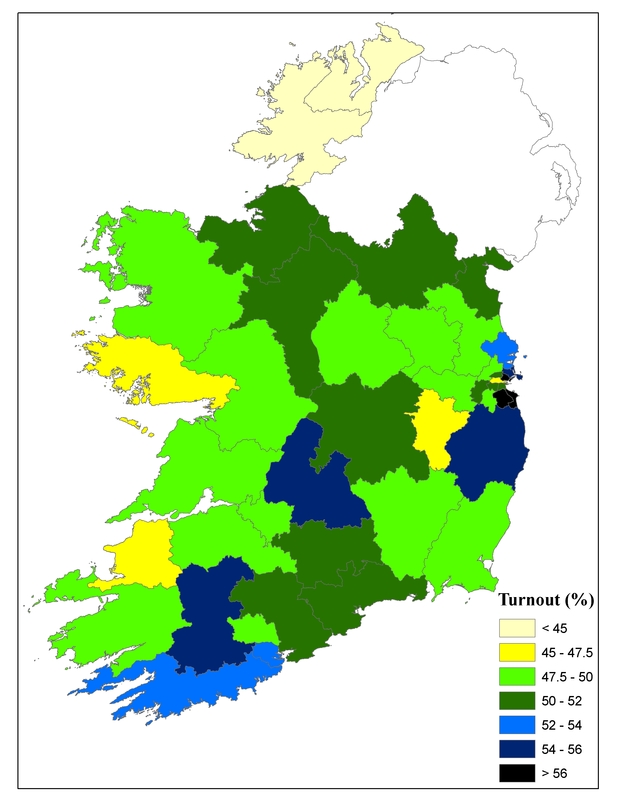 That said, higher than average turnout levels are also associated with a number of rural constituencies, most notably those located in Cork and Tipperary. The extent of the difference in turnout levels between the constituencies that usually have the highest and lowest turnout level in European Union Treaty referendum elections is readily evident from Figure 1b above. The pattern observed for turnout levels is also evident when spoilt vote patterns are studied with Figure 2 showing that rural constituencies tend to have the highest spoilt vote levels in these European Union referendum contests. 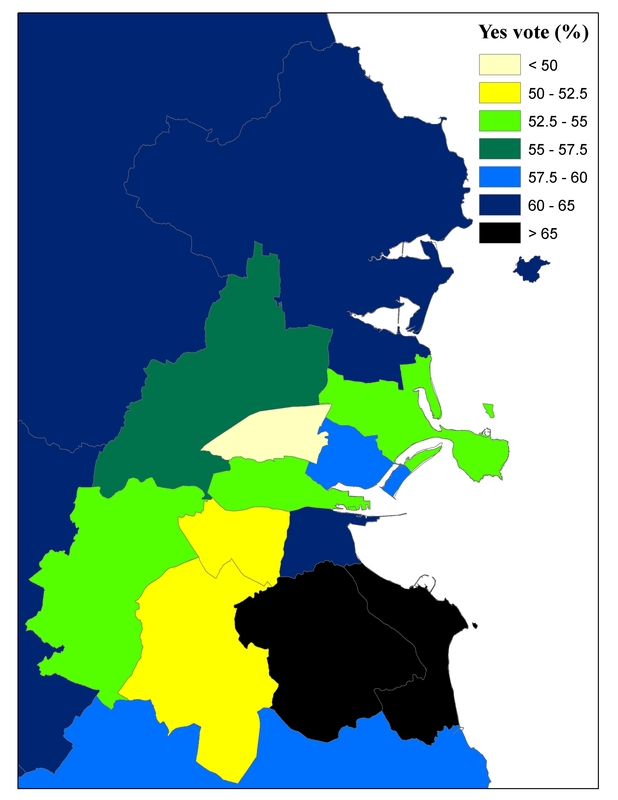 The low average spoilt vote levels in the “Dublin County” constituencies may be in part explained by the use of electronic voting in these constituencies for the 2002 Nice Treaty referendum – meaning thatr spoilt vote levels in these constituencies were 0% by default in those contests – but it is worth noting that levels in these constituencies are also lower than those in the Meath constituencies which also would have used electronic voting (in the old Meath constituency) for that same contest. 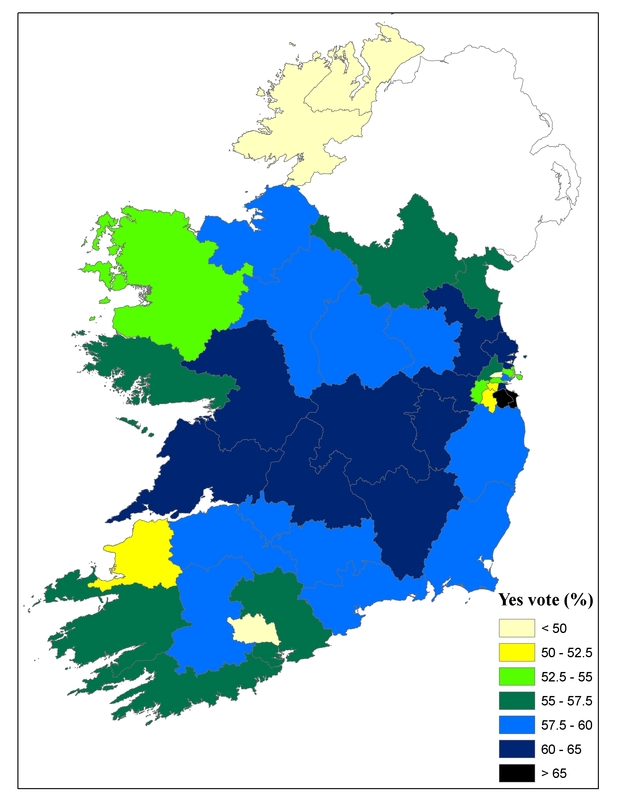 On average spoilt vote levels stand at 0.66% in Dublin against a level of 0,75% for the more working class Dublin constituencies and of 0.99% for the rest of the state, with the highest spoilt vote levels associated with the Tipperary South and Sligo-North Leitrim (Sligo-Leitrim constituencies). 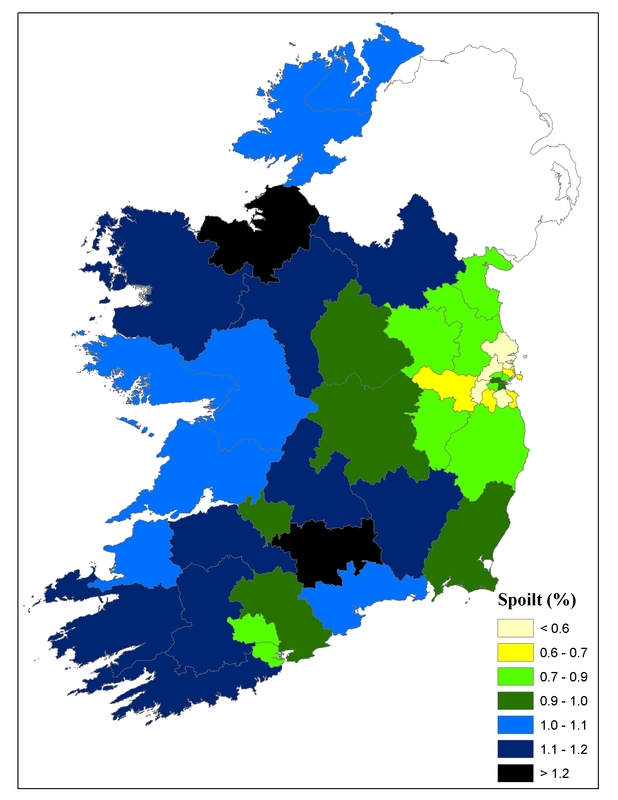 Figure 3 shows the geography of average support levels for European Treaty referendum votes, showing that a number of constituencies in rural Ireland tend to be associated with higher than average Yes votes (in percentage terms) in these contests with these constituencies being clustered in the hinterland of Dublin, the South Midlands and Mid West regions. By contrast, the highest level of opposition to European Treaty referendums tend to be consistently associated with a number of other rural constituencies with higher than average No vote levels being associated with the Kerry North-West Limerick (the old Kerry North) constituency but more especially with the two Donegal constituencies, which along with the more urban Cork North-Central and Dublin North-West constituencies, are the only constituencies to have had a higher than average No vote (as opposed to a Yes vote) across these five contests. Looking more closely at Dublin, a significant class divide emerges in terms of support patterns in European Treaty referendums, with the highest Yes vote levels being associated with the more middle class constituencies, such as Dun Laoghaire and Dublin South, but with higher than average support levels for the No side in these campaigns being found in the more working class constituencies, such as Dublin North West, Dublin South Central and Dublin South West. On average, there is a very large difference between the average support levels for the Yes side in the more middle class and working class Dublin constituencies, with these average support for the Yes side standing at 65.2% for the Dun Laoghaire, Dublin South, Dublin South-East and Dublin North-Central constituencies and at 50.3% for the Dublin North-West, Dublin South-Central and Dublin South-West constituencies. Taking account of the geographical trends at the national level and within Dublin, there is a remarkable consistency between the geography of Sinn Fein support and the geography of support for the No side in these European Treaty referendum campaigns. In light of this, it may be interesting to study the “No” support trends in constituencies in which Sinn Fein experienced a significant increase in support at the 2011 General Election. This entry was posted in Constituency information, Electoral Geography (voting maps), Referendum elections, Voter turnout and tagged referenda, Sinn Fein, voter turnout. Bookmark the permalink.